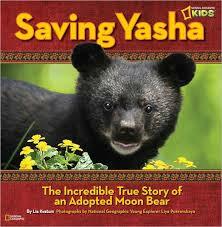 Saving Yasha: the incredible true story of an adopted moon bear would find an audience in my library, since most children here in the northeast love reading about bears. Not a book of facts, instead author Lia Kvatum recounts how two young scientists found an orphaned bear in the Russian wilderness. Rough hands grabbed Yasha. Creatures with two legs instead of four put him in a box with bars so he couldn’t escape. With painstaking care, they trained him and two other cubs on how to survive in their natural habitat so they could be returned to the wilderness. The scientists were always kind and gentle, but they wore special clothing to cover their smell and never talked or played with the cubs. They wanted to make sure the cubs would grow up to live as wild bears. Partnered with the text are full-page color photographs by Russian scientist Liya Pokrovskaya. The pictures are stunning and will make readers feel as if they are right there in the woods working with the baby moon bears. In the classroom, you can pair Saving Yasha with In Search of the Golden Moon Bear by Sy Montgomery.